In 1650, more than a dozen "witches" were executed in the British city of Newcastle, and their bodies heaped together in a mass grave. Now, several centuries later, their remains are said to be resurfacing. First, workers uncovered bones and skulls while digging a ditch around St. Andrew’s Church. Then, more bones began to appear in the churchyard, rising to the surface whenever it rained. But anyone seeking a gruesome souvenir should heed the warnings of the church's caretaker. It seems one of the ditch diggers picked up a skull he'd found and showed it off to his friends. The next day, he woke to find his arms covered with sores and lesions that his doctor couldn't explain. Perhaps the women (and one man) are still a bit angry about their fate. Back in the 17th century, Newcastle's citizens were paid a handsome sum for each "witch" they turned over to the authorities. As a result, innocent people were often accused of witchcraft and sent to early graves. 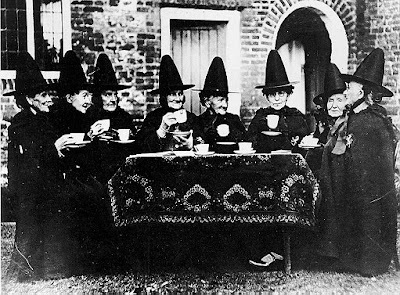 It's unlikely that the witches buried near St. Andrew's Church were guilty of of anything other than being a little eccentric. Read more about the Newcastle witches (and see a video) here. i will NEVER go there when it rains! i kno........ just saying it IS scientificly possible. thats does sound creepy. i think the blog should do a think on VODOO. ha ha. VODOO. thats fun to say. I wonder why people are so much more superstitious then than now! How many of you (regular commenters) are boys/girls? It's funny, but from our nicknames it's a little hard to tell our genders. I agree with bookworm, a disease is probably possible. I read that some cases of "mummy's curse" were actually ancient bacteria that survived all that time! But you'd have to do tests on the bones to know if they were infected with anything nasty... and anyway, who's to say a curse can't manifest as a disease? But on the other hand the people killed probably weren't real witches so they couldn't cast a curse, but maybe god or something cursed the place because of the cruel acts of the witch hunters. thats really creepy and would make a pretty awsome argument on magic and physics, but i have to agree with bookworm and judith. Voodoo. Yes, I think that deserves a post or twelve. yes! we will have our revenge! !erm...i mean, they will have their revenge!!! just saying, that, don't you think that if you killed the witches early, they might just come back for revenge? I mean, sure, you just die one day, but because some bozo (with no proof!) just pointed to a random person and said, 'that's a wtch!' And where is the evidence exactly? You kill people for no reason?! For all we know, the person tattling like crazy might as well be a witch!